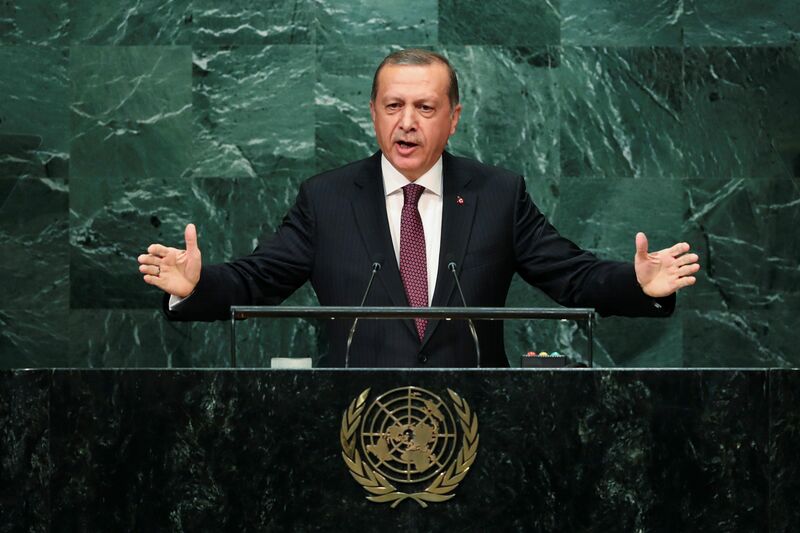 In his speeches at the U.N., President Erdogan called on the international community to do its part to share the burden of the conflict. UNITED NATIONS ― Turkey has lambasted the international community for what it feels is an inadequate response to the Syrian crisis and for neglecting to fully embrace the humanitarian values the U.N. strives to uphold. Turkish President Recep Tayyip Erdogan flayed the West in particular during last week’s U.N. Leaders’ Summit on Refugees, which took place after the first U.N.-wide summit on refugees and migrants on the sidelines of the General Assembly, for failing to sufficiently address the human toll of the Syrian civil war, now in its sixth year. The fighting has resulted in 470,000 dead, 4.8 million refugees and 6.1 million people internally displaced. “The international community, especially the European Union, can never account for the inconsistency they have displayed in the face of such a fundamental humanitarian crisis,” he said. 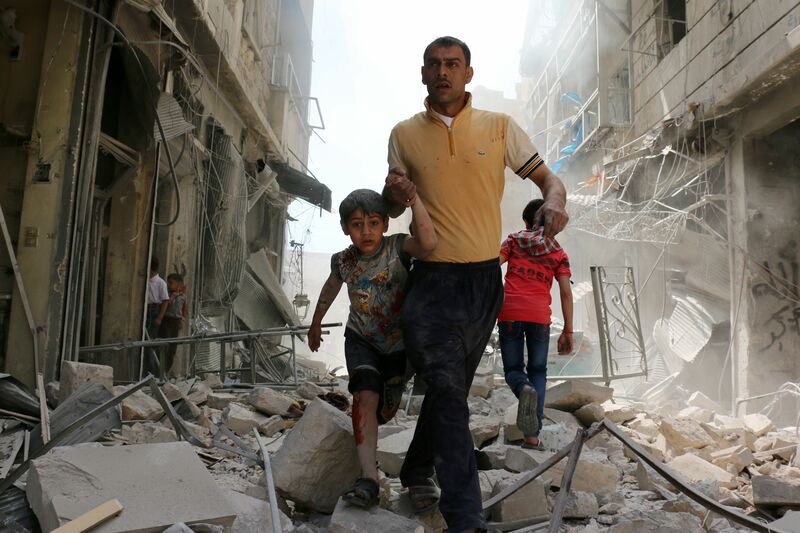 A Syrian man evacuates an area following a reported airstrike on April 22, 2016 in the rebel-held neighborhood of Hayy Aqyul in Aleppo. The Turkish president reminded the audience of the refugees that have since become symbols of the tragedy of his neighboring country’s war: Alan Kurdi, the toddler who drowned on Turkey’s shores after fleeing Syria and 5-year-old Omran Daqneesh, the boy in an orange ambulance seat rescued after an Aleppo airstrike, whose dust-covered and bloodied face humanized the situation for the global community in August. Erdogan’s plea followed a faltering Syrian truce and an attack on a humanitarian aid convoy near Aleppo, prompting the U.N. to temporarily suspend deliveries across the country. Though it is unclear what caused the bombing of the convoy, Turkey’s official position is that a Syrian regime airstrike struck the trucks as they made their way toward Aleppo. The U.S. blames Russia, but Russia and Syria deny responsibility. 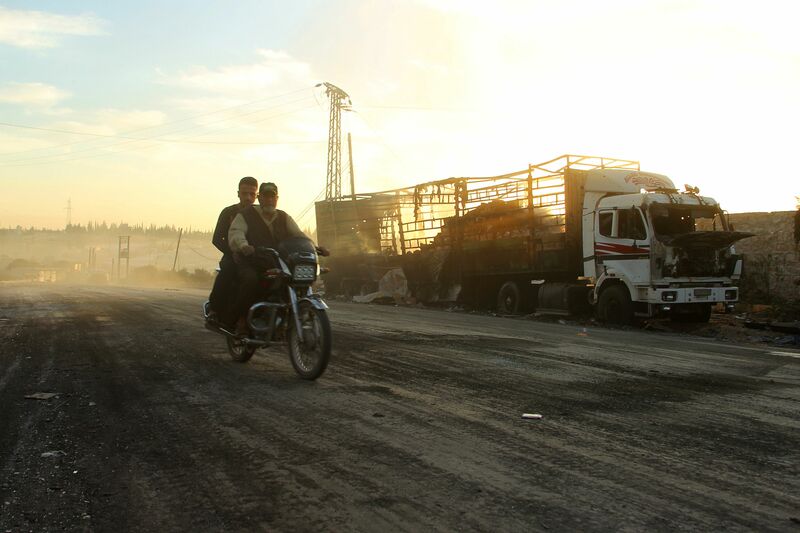 Men drive a motorcycle near a damaged aid truck after an airstrike on the rebel-held Urm al-Kubra town, western Aleppo city, Syria on September 20, 2016. Miles from Aleppo, where the U.N. said Friday persistent bombing has left nearly 2 million people without water, Syrian refugees who have managed to escape are trying to set up home in a new country, even as they leave other family members behind. Leyla, a 31-year-old mother of two young girls from Aleppo now lives in Izmir, a large city in western Turkey. She used to be an elementary school teacher in Syria, but had to flee after it became too dangerous for the family. And that was long before this month’s relentless bombing of Aleppo, whose residents are among the 13.5 million Syrians dependent on humanitarian aid. 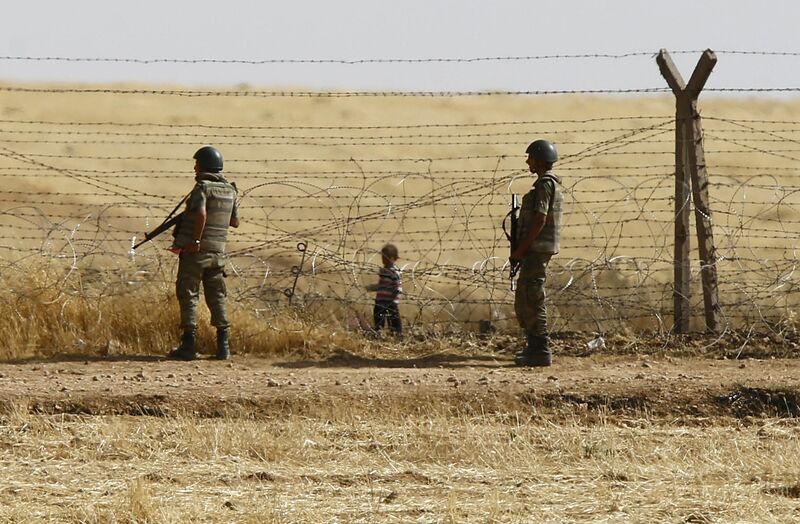 Turkish soldiers stand guard as a Syrian refugee boy waits behind the border fences to cross into Turkey, near the southeastern town of Akcakale in Sanliurfa province, Turkey, June 5, 2015. Turkey, which hosts the largest number of refugees in the world and shares a 566-mile border with Syria, bears the brunt of the influx of refugees and migrants. Now it wants the global community to take more responsibility over the refugee crisis and share some of the burden. In the town of Reyhanlı, on the Mediterranean coast of southeastern Turkey near the Syrian border, the refugee crisis has played out since civil war erupted in 2011. Syrian families, each with several children, stroll around Yenişehir Pond at the town’s edge by the side of a 10-foot concrete wall over which one can see the Syrian side. Arabic signs seem to have taken over Turkish ones, although the origins of most townspeople is Arab Turk, and most people there are bilingual in Arabic and Turkish. Refugees fleeing to Reyhanlı have overhauled the demographics of this town and with it, the whole social structure, according to Fatih Turan, a local lawyer. Once a Turkish-majority place, there are now only 90,000 Turks as opposed to about 125,000 Syrians, he said. Turan often takes divorce cases that women here have filed against their Turkish husbands’ “secret” second marriages to Syrian women. In this picture taken on Friday, Oct. 23, 2015, Syrian refugee Anwar Ahmad Abdullah, 42, holds his son at their unfurnished home, in the Turkish-Syrian border city of Reyhanli. “Turkish families are leaving. Even my family left for Hatay, the city nearby,” Turan said. He now commutes to Reyhanlı only for work. In spite of this, Turkish people are generally still compassionate toward refugees and, unlike some European Union countries, Turkey has kept its borders open since the Syrian crisis began. Çavuşoğlu at the U.N meeting on refugees and migrants stressed that there is, however, an urgent need to stop irregular migration. 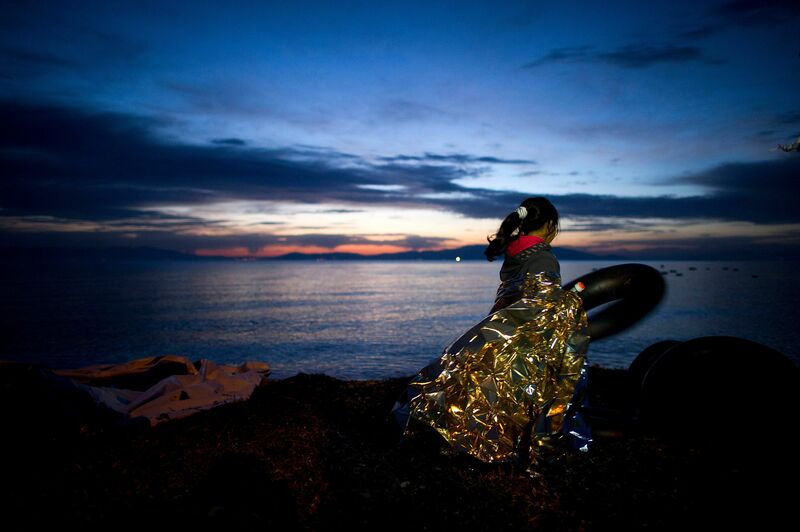 A Syrian girl holds on to a rubber float during sunrise after arriving on an inflatable boat with other refugees, crossing the sea from Turkey to Lesbos, Greece, on March 9, 2016. Turkish officials have laid out plans on the relocation of refugees ― including an overhaul of accommodation at confined camps and container cities, where about 10 percent of the some 3 million refugees live. The remaining refugees in Turkey reside in cities, where many are without a job because they lack language and other vital skills. The country has given some 15,000 of those who seek employment vocational training, Erdogan said at the leaders’ summit, and believes it is important to allow refugees to live and work in the cities instead of being confined to temporary accommodation. In addition, Turkey welcomed new regulations in January to allow many Syrian refugees to apply for legal work permits. Discussions are also underway to eventually grant citizenship to refugees, despite the social backlash from Turkish citizens, Erdogan added, noting that officials are aware of the social stakes but, “we have assumed this risk and we will never regret it.” Many Turkish people oppose such a move, amid a tight job market in a country reeling from terrorist attacks and a failed summer coup.